Rome (pronounced /roʊm/; Italian: Roma, pronounced [ˈroma]; Latin: Roma) is the capital city of Italy and of the Lazio region, and is Italy's largest and most populous city. Rome's history spans more than 2,500 years. It is renowned as one of the founding cities of Western Civilization. Along with its central place in the history of the Roman Empire, Rome has a significant place in the history of Christianity. Up to the present day it endures as the city surrounding Vatican City, the home of the papacy. The worldwide Roman Catholic Church is administered from the Vatican City, run by the Holy See as an independent enclave within Rome and the world's smallest sovereign state. Today, Rome is a modern, cosmopolitan city, and the third most-visited tourist destination in the European Union. Due to its influence in politics, media, the arts, and culture, Rome has been described as a global city and is known worldwide as the "Eternal City." As one of the few major European cities that escaped World War II relatively unscathed, central Rome remains essentially Renaissance and Baroque in character. The historic center, including numerous religious and public buildings, is listed by UNESCO as a World Heritage Site. That organization has noted it for its "unique artistic achievements," "remarkable examples of great early Christian basilicas," because it "exerted considerable influence on the development of architecture and monumental arts," and is "directly and tangibly associated with the history of the origins of the Christian religion." The name could derive from the names of legendary founders of Rome, the twins Romulus and Remus, or from the Etruscan word "rumon," which means "river," or from the Greek "reuma," which means "flowing," or from an archaic Latin word "ruma," which means the hump of an animal's back, and can be imagined to mean "hill." The city of Rome is located in the Lazio region of central Italy on the Tiber river (Italian: Tevere). The original settlement developed on hills which faced a ford beside the Tiber island, the only natural ford on the river. The historic center of Rome was built on seven hills: The Aventine Hill, the Caelian Hill, the Capitoline Hill, the Esquiline Hill, the Palatine Hill, the Quirinal Hill, and the Viminal Hill. The city is also traversed by another river, the Aniene, with joins the Tiber to the north of the historic center. 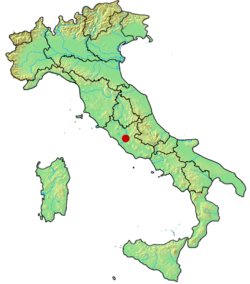 Although the city center is about 24 kilometres (14.9 mi) inland from the Tyrrhenian Sea, the city territory extends to the shore, where the south-western Ostia district is located. The altitude of the central part of Rome ranges from 13 m (43 ft) above sea level (at the base of the Pantheon) to 139 m (456 ft) above sea level (the peak of Monte Mario). The comune of Rome covers an overall area of about 1,285 km² (496 sq mi), including many green areas. Rome enjoys a typical Mediterranean climate. The average maximum temperature in July is around 86°F (30°C), although it can be uncomfortably hot, with temperatures often exceeding 95°F (35°C) at midday. Romans tend to take holidays in cooler spots during August. The average maximum daytime temperature in January is 55°F (13°C). The Roman ottobrate or "beautiful October days" are known as sunny and warm days. Mean annual precipitation is 31 inches (790 mm). Historically, the urban limits of Rome were considered to be the area within the city walls, which were 12 miles (19 km) long by 270 C.E. 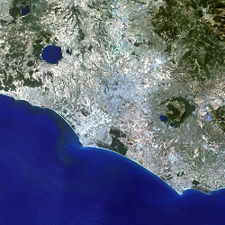 Modern Romans frequently consider the city's urban area to be delimited by its ring-road, the Grande Raccordo Anulare, which circles the city center at a distance of about six miles (10 km). Panorama of Rome from the dome of St. Peter's Basilica. 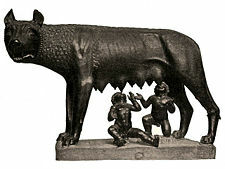 Capitoline Wolf suckles the infant twins Romulus and Remus. 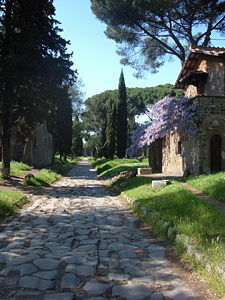 The Appian Way, constructed in the fourth century B.C.E. 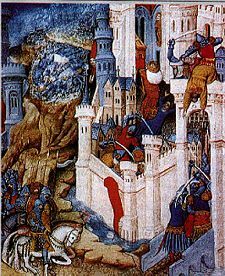 Fifteenth-century miniature depicting the Sack of Rome of 410. According to Roman tradition, the city was founded by the twins Romulus and Remus on April 21, 753 B.C.E. Archaeological evidence supports the view that Rome grew from pastoral settlements on the Palatine Hill built in the area of what became the Roman Forum, possibly in the middle of the eighth century B.C.E. The original settlement developed into the capital of the Roman Kingdom (ruled by a succession of seven kings, according to tradition), and then the Roman Republic (from 510 B.C.E., governed by the Senate), and finally the Roman Empire (from 27 B.C.E., ruled by an Emperor). Military conquest, commercial predominance, as well as selective assimilation of neighboring civilizations, most notably the Etruscans and Greeks, were part of the city's early growth. Rome had been undefeated in war until 386 B.C.E., when it was briefly occupied by the Gauls. Roman dominance expanded over the shores of the Mediterranean Sea, reaching a population of one million people, and for almost 1,000 years, Rome was the most politically important, richest and largest city in the Western world, until it was surpassed by the Eastern capital Constantinople. With the reign of Constantine I (306-337), the Bishop of Rome gained political as well as religious importance, eventually becoming known as the Pope and establishing Rome as the center of the Catholic Church. After the sack of Rome in 410 C.E. by Alaric I and the fall of the Western Roman Empire in 476 C.E., Rome alternated between Byzantine and plundering by Germanic barbarians. Its population declined to a mere 20,000 during the Early Middle Ages, reducing the sprawling city to groups of inhabited buildings interspersed among large areas of ruins and vegetation. Rome remained nominally part of the Byzantine Empire until 751, when the Lombards finally abolished the Exarchate of Ravenna. In 756, Pepin the Short (714-768) gave the pope temporal jurisdiction over Rome and surrounding areas, thus creating the Papal States. Rome remained the capital of the Papal States until its annexation into the Kingdom of Italy in 1870; the city became a major pilgrimage site during the Middle Ages and the focus of struggles between the Papacy and the Holy Roman Empire starting with Charlemagne (747-814), who was crowned its first emperor in Rome in 800 by Pope Leo III. Apart from brief periods as an independent city during the Middle Ages, Rome kept its status of Papal capital and "holy city" for centuries, even when the Pope briefly relocated to Avignon (1309–1377). The latter half of the fifteenth century saw the seat of the Italian Renaissance move to Rome from Florence. The popes wanted to surpass the grandeur of other Italian cities and created ever more extravagant churches, bridges, and public spaces, including a new Saint Peter's Basilica, the Sistine Chapel, Ponte Sisto, and Piazza Navona. The Popes were also patrons of the arts engaging such artists as Michelangelo, Perugino, Raphael, Ghirlandaio, Luca Signorelli, Botticelli, and Cosimo Rosselli. The period was also infamous for papal corruption with many popes fathering children, and engaging in nepotism and simony. The corruption of the Popes and the extravagance of their building projects led, in part, to the Protestant Reformation (1517-1648) and, in turn, the Counter-reformation (1560-1648). Italy became caught up in the nationalistic turmoils of the nineteenth century and twice gained and lost a short-lived independence. Rome became the focus of hopes of Italian reunification when the rest of Italy was reunited under the Kingdom of Italy with a temporary capital at Florence. In 1861, Rome was declared the capital of Italy even though it was still under the control of the Pope. During the 1860s the last vestiges of the Papal states were under French protection. And it was only when this was lifted in 1870, owing to the outbreak of the Franco-Prussian War, that Italian troops were able to capture Rome. After a victorious World War I (1914-1918), Rome witnessed the rise to power of Italian fascism guided by Benito Mussolini (1883-1945), who marched on the city in 1922, eventually declared a new Empire, and allied Italy with Nazi Germany. This was a period of rapid growth in population, from the 212,000 people at the time of unification to more than one million people, but this trend was halted by World War II (1939-1945), during which Rome was damaged by both Allied forces bombing and Nazi occupation. After the execution of Mussolini and the end of the war, a 1946 referendum abolished the monarchy in favor of the Italian Republic. Rome grew momentously after the war, as one of the driving forces behind the "Italian economic miracle" of post-war reconstruction and modernization. It became a fashionable city in the 1950s and early 1960s, the years of la dolce vita ("the sweet life"), and a new rising trend in population continued till the mid-1980s, when the commune had more than 2,800,000 residents; after that, population started to slowly decline as more residents moved to nearby suburbs. The Quirinal Palace, official residence of the President of the Italian Republic. Rome is the capital of Italy and is the seat of the Italian Government, a republic in which the president is chief of state who is elected by an electoral college for a seven-year term. The prime minister, who is head of government, is appointed by the president and confirmed by parliament. The bicameral Parlamento consists of a senate of 315 members, and the chamber of deputies of 630 members, both houses elected by popular vote to serve five-year terms. Rome is the largest of Italy's 8101 comuni, and is governed by a mayor, and a city council. The seat of the comune is in on the Capitoline Hill the historic seat of government in Rome. Rome is divided into 19 administrative areas, called municipi, each of which is governed by a president and a council of four members who are elected every five years. The historic center is divided into 22 rioni, all of which are located within the Aurelian walls except Prati and Borgo. Newer districts were designated as quarters, of which there were 35 in 2008. Rome also has six officially designated suburban zones and 52 agricultural zones. Rome is unique in having a sovereign state located within its city limits, the Vatican City, which is a enclave of Rome and a sovereign possession of the Holy See, the supreme government of the Roman Catholic Church. Rome hosts foreign embassies to both Italy and the Holy See, although frequently the same ambassador is accredited to both. Rome is also the seat of organizations of the United Nations, such as the World Food Program, the Food and Agriculture Organization, and the International Fund for Agricultural Development. In 1957, Rome hosted the signing of the Treaty of Rome, which established the European Economic Community (predecessor to the European Union), and also played host to the official signing of the proposed European constitution in July 2004. Eni's headquarters in EUR, Rome's business district. Roma Termini railway station is one of the largest train stations in Europe. Italy has a diversified industrial economy with roughly the same total and per capita output as France and the United Kingdom, although it is constrained by high taxes, a rigid labor market, and over-generous pensions. Modern day Rome has a dynamic and diverse economy with thriving technology, communications, and service sectors. The city is a center for banking as well as electronics and aerospace industries. Numerous international headquarters, government ministries, conference centers, sports venues and museums are located in Rome's principal business districts: the Esposizione Universale Roma; the Torrino (further south from the EUR); the Magliana; the Parco de' Medici-Laurentina, and the Tiburtina-valley. The city hosts the headquarters of three of the world's 100 largest companies: Enel, ENI, and Telecom Italia. Tourism is inevitably one of Rome's chief industries, with numerous notable museums including the Vatican Museum, the Borghese Gallery, and the Musei Capitolini. Industries include engineering, electronics, chemicals, printing, clothing, and food processing. Rome is the hub of the Italian film industry, thanks to the Cinecittà studios, which were founded, in 1937, by Benito Mussolini. The 99 acre (40 ha) studio complex is 5.6 miles (9 km) from the center of Rome and is part of one of the biggest production communities in the world, second only to Hollywood. Rome was listed as having the 38th largest gross domestic product in the world in 2005, at US$123-billion. Per capita GDP was US$47,000. The city produces 6.7 percent of Italy's GDP, which was more than any other city in that country, and continued to grow at 4 percent annually, at a higher rate than any other city in the country. Rome is at the center of a network of roads which roughly follow the lines of the ancient Roman roads that began at the Capitoline Hill, and suffers considerable traffic congestion. Today Rome is circled, at a distance of about 10 km, by the ring-road called the Grande Raccordo Anulare. Above-ground public transport in Rome is made up of a bus and tram network. Rome has a two-line metro system called the Metropolitana, the building of which started in the 1930s. Rome's main train station, Termini is one of the biggest train stations in Europe, with 29 platforms, over 150 million passengers each year, with around 400,000 daily travelers. Rome's international airport, Fiumicino, is Italy's chief airport, the older Rome Ciampino Airport is a joint civilian and military airport, and the Aeroporto dell'Urbe, is a small, low-traffic airport located about 6 km north of the city center. In 2007, there were 2,718,768 people residing in Rome, and some four million in the greater Rome area. In the five years between 2002 and 2007, the population of Rome grew by 6.54 percent, while Italy as a whole grew by 3.56 percent. The 2007 birth rate of Rome was 9.10 births per 1,000 inhabitants compared to the Italian average of 9.45 births. Rome was the largest city in the world, and probably the largest ever built until the nineteenth century. Estimates of its peak population range from 450,000 to over 3.5 million people at the time of emperor Augustus (63 B.C.E. to 19 C.E.). After the fall of the Roman Empire, the city's population fell dramatically to fewer than 50,000 people, and continued to either stagnate or shrink until the Renaissance. When the Kingdom of Italy annexed Rome in 1870, it had a population of about 200,000, which rapidly increased to 600,000 at the eve of World War I. A large majority of the population in 2006, 92.63 percent, was Italian. The largest other ethnic groups came from from Romania and Poland, 3.14 percent, East Asia (mostly Filipino), 1.28 percent, and the Americas (mostly from Peru), 1.09 percent. There were also tens of thousands of illegal immigrants living in Rome. The original language of Rome was Latin, which evolved during the Middle Ages into Italian. The latter emerged as the confluence of various regional dialects, among which the Tuscan dialect predominated, but the population of Rome also developed its own dialect, the Romanesco. Rome is the center of the Roman Catholic denomination of Christianity, and much in common with the rest of Italy, the large majority of Romans are Roman Catholics. In recent years, the Islamic community in Rome has grown significantly, in great part due to immigration from North African and Middle Eastern countries. As a consequence, the city promoted the building of the largest mosque in Europe, inaugurated in 1995. Rome is a nation-wide center for higher education. Its first university, La Sapienza (founded in 1303), has more than 150,000 students. The University of Rome Tor Vergata was founded in 1982, and Roma Tre in 1992. Rome also contains a number of pontifical universities and institutes, including the Pontifical Gregorian University (the oldest Jesuit university in the world, founded in 1551), the Pontifical University of St. Thomas Aquinas. There are a number of private universities. 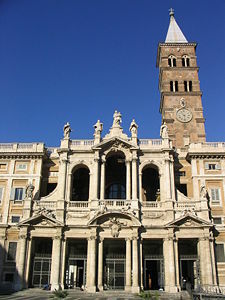 The Basilica di Santa Maria Maggiore is the largest church in Rome dedicated to the Blessed Virgin Mary. One of the symbols of Rome is the Colosseum (70–80 C.E. ), the largest amphitheater ever built in the Roman Empire. Originally capable of seating 60,000 spectators, it was used for gladiatorial combat. 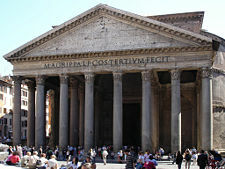 The list of important monuments includes the Roman Forum, the Domus Aurea, the Pantheon, Trajan's Column, Trajan's Market, the Catacombs, the Circus Maximus, the Baths of Caracalla, Castel Sant'Angelo, the Mausoleum of Augustus, the Ara Pacis, the Arch of Constantine, the Pyramid of Cestius, and the Bocca della Verità. Often overlooked, Rome has an extensive medieval heritage. Basilicas dating from the Paleochristian age include Santa Maria Maggiore and San Paolo Fuori le Mura, both housing precious fourth century mosaics. The twelfth century Basilica di San Clemente, located near the Colosseum, is built on top of a well-preserved fourth century church (with many frescoes), which was built next to a third century Mithraic Temple. Notable medieval mosaic and fresco art can be found in the churches of Santa Maria in Trastevere, Santi Quattro Coronati and Santa Prassede. Lay buildings include a number of towers, the largest being the Torre delle Milizie and the Torre dei Conti, both next the Roman Forum, and the huge staircase leading to the basilica of Santa Maria in Ara Coeli. The most impressive Renaissance architecture masterpiece in Rome is the Piazza del Campidoglio by Michelangelo, along with the Palazzo Senatorio, seat of the city government. During this period, the great aristocratic families of Rome used to build opulent dwellings as the Palazzo del Quirinale (now seat of the President of the Italian Republic), the Palazzo Venezia, the Palazzo Farnese, the Palazzo Barberini, the Palazzo Chigi (now seat of the Italian Prime Minister), the Palazzo Spada, the Palazzo della Cancelleria, and the Villa Farnesina. The principal squares, often adorned with obelisks and built in the 17th century, are Piazza Navona, Piazza di Spagna, Campo de' Fiori, Piazza Venezia, Piazza Farnese, and Piazza della Minerva. Public parks and nature reserves cover a large area. 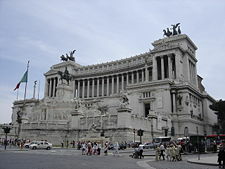 After 1870, when Rome became capital city of the new Kingdom of Italy, many great palaces in neoclassical styles were built to host ministries, embassies and other governing agencies, most especially the Monument of Vittorio Emanuele II, where the Grave of the Unknown Soldier that represents the 650,000 Italians that fell in World War I is located. The most important fascist site is the Esposizione Universale Roma district, most especially the Palazzo della Civiltà Italiana (1938–1943), the iconic design of which has been labeled the cubic or Square Colosseum. The most important museums and galleries include the National Museum of Rome, the Museum of Roman Civilization, the Villa Giulia National Etruscan Museum, the Capitoline Museums, the Borghese Gallery, the Museum of Castel Sant'Angelo, and the National Gallery of Modern Art. Rome hosts the Accademia Nazionale di Santa Cecilia (founded in 1585), and an opera house, the Teatro dell'Opera di Roma, as well as several minor musical institutions. Rome hosted the 1960 Summer Olympics and is an official candidate to hosting the 2020 Summer Olympics. Football is the most popular sport in Rome, as in the rest of the country. Rugby union is gaining wider acceptance. Every May, Rome hosts the ATP Masters Series tennis tournament on the clay courts of the Foro Italico. Cycling was immensely popular in the post-World War II period. "The Eternal City" is a nickname for the city of Rome, which is Italy's largest and most-populous city. Rome has a huge legacy, since it stands on more than 2500 years of history, was once the largest city in the world, was the center of Western civilization, and is still the heart of Christianity, being seat of the Roman Catholic Church which controls the Vatican City. 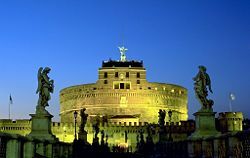 This legacy, plus Rome's famous buildings and status as a world heritage site continues to attract a steady flow international visitors each year, making it the third most-visited tourist destination in the European Union. ↑ Ravaglioli Armando, Roma anno 2750 ab Urbe condita (Rome: Tascabili Economici Newton, 1997, ISBN 888183670X). ↑ John Noble Wilford, June 12, 2007, More Clues in the Legend (or Is It Fact?) of Romulus, New York Times. Retrieved October 20, 2008. ↑ Istituto Nazionale di Statistica, Demography in figures. Retrieved October 20, 2008. ↑ Caroline Bremner, October 11, 2007, Top 150 City Destinations—London Leads the Way, Euromonitor International. Retrieved October 20, 2008. Brilliant, Richard. 2006. Roman Art: An American's View. Roma: Di Renzo. ISBN 9788883230851. Lucentini, Mario. 2002. La Grande Guida di Roma. Newton & Compton. Rome. ISBN 88-8289-053-8. Neskow, Vesna, and Kerren Barbas Steckler. 2007. The Little Black Book of Rome: The Timeless Guide to the Eternal City. White Plains, NY: Peter Pauper Press. ISBN 9781593598594. Sullivan, George H. 2006. Not Built in a Day: Exploring the Architecture of Rome. New York: Carroll & Graf. ISBN 9780786717491. World Fact Book. 2008. Italy. Retrieved October 17, 2008. This page was last modified on 17 July 2015, at 15:53.